"There are, however, many more novels and short stories of impossible crimes that were published in other languages and that have never been translated into English." Recently, I discussed three Dutch locked room mysteries, one novel and a pair of short stories, which reminded me there was a particular filler-post patiently waiting on the back-burner for my attention. There are a number of such posts that need to be written or updated, such as my lists of favorite locked room novels and short stories, but always wanted to redo the rundown of Dutch-language impossible crime stories I posted, years ago, on the GAD Wiki – which could now be augmented with additional material. I know most of you will probably grumble and growl at a catalog of mostly untranslated mysteries, but this blog-post is more of a personal note to myself. You might have noticed my deep, burning and undying love for the impossible crime story. So, naturally, I have always been on the lookout for some homespun miracles of the criminal kind, but result was discouraging to say the least. For years, I was stuck at five titles, divided between two writers, which left me with practically no hope of adding anything worthwhile to that small stack of books. Until recently, that is, when they slowly began to accumulate in front of me out of nowhere. And they seemed to come crawling out of every nook and cranny of the genre: the Golden Decade (1930s), the post-WWII period and even the 21st century! So now those five titles have grown into a modest stack of more than twenty Dutch-language locked room tales, which makes me want to wave the national driekleur (tricolor) and putting the band back together. Yes, that last part is a euphemism for reassembling the Dutch Empire and the recolonization of Southeast Asia. Who wants to be the Governor-General of the New Dutch East Indies? But enough padding for one badly written filler-post. Let's take a crack at this list! Appie Baantjer was a homicide detective with 40 years of service on the Amsterdam police-force, but during the early 1960s he made his first, tentative steps in becoming one of the most successful crime novelists of the Netherlands – selling close to eight million copies during his lifetime. A Noose for Bobby is where it all began. The first three-quarters of the plot is a study of character, pitting a police-inspector against a ruthless pimp, but the last quarter turns into a technical impossible crime story when the villain of the piece is found swinging from a rope in the proverbial locked room. A very old and worn trick is used to lock the door from the inside, but the clue of the electric wiring is something one would expect from John Rhode. Marco Books is a grossly underrated writer of police-detective and thrillers, who occasionally takes a stab at the locked room problem, which began with this 2010 novel. The plot is primarily concerned with the murder of a doctor and the numerous attempts on the life of a local alderman, but towards the end there's an impossible poisoning behind multiple locked doors. A minor side-puzzle with a simplistic answer, but good enough to complement the overall plot. 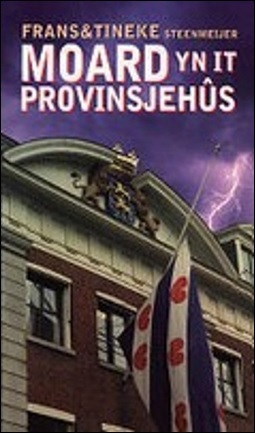 A figure head of the Dutch criminal underworld, Fred Duijster, is found gutted in his tightly secured, fortress-like home. The windows were covered with steel shutters and the ground around the house is monitored with motion sensors that trigger over head lights, back and front, and activate the CCTV cameras – which captured only one person entering and leaving the premise at the time of the murder. But is he guilty? It's a locked room conundrum in the same vein (and quality) as Marcia Muller's The Tree of Death (1983) and Herbert Resnicow's The Gold Solution (1983), but with an even better explanation. As a matter of fact, I believe this to be one of the best titles on this list. Once upon a time, the Belgian-born Willy Corsari was the Grand Dame of the Dutch-language detective story, but her work always struck me as extremely uneven and her lowest point can be found in her debut novel – which has a horribly misleading book-title. The impossibility concerned a man with a broken neck found in a house completely locked from the inside, but dissolved in an anti-detective story with twins and sleepwalkers. The final "twist" was excruciatingly bad. Luckily, Corsari would go on to write at least one decent impossible crime novel. An early, standalone novel with a German movie-and television company as a backdrop and the opening sequence of the story shows dashes of imaginative writing – rewinding and fast-forwarding between scenes like a movie. Unfortunately, the impossible stabbing of an actress in front of a rolling camera is underplayed and has a dull, routine solution. However, it's a mountainous improvement on her first attempt at penning a locked room novel. A legitimate and not entirely unsuccessful treatment of the locked room trope! The book concerns the complications surrounding the murder of Sir John Judge, born as Jan Rechter, who left his native country to amass a fortune on the British Isles, but the past has patiently awaited his return home – ending with a deadly shooting inside a locked study. One important piece of information is withheld from the reader, but the policeman was unaware of it as well. So, at the time, I was willing to show some leniency on that point, because I had finally found a Dutch-language locked room mystery from the Golden Age. Cor Docter was a prolific pulp-writer, known as "The Prince of the Lending Libraries," but during the early 1970s he wrote three traditionally-styled detective novels and one of them was a first-class locked room story. Cold Woman in Kralingen is a topographical roman policier, situated in a neighborhood of Rotterdam, where the stabbing of a gardener leads Commissioner Daan Vissering to a shadowy society known as Kostbaar Kralingen (Precious Kralingen). During one of their regular meetings, one of their members is murdered inside a sealed bedroom and the murderer appears to have been trapped inside. The key was tossed, underneath the crack of the door, into the hallway where everyone had gathered, but when they battered down the door all they found was a murdered woman! The solution is proof of Docter's credentials as a writer of pulp-fiction, but it's a good and original answer. One that makes this book one of the better titles on this list. Robert van Gulik was a diplomat, sinologist and an author of a series of detective novels, short stories and novellas about a Chinese magistrate from the 7th century, Judge Dee – which played an vital role in popularizing historical mysteries. This is one of the first books in the series and dispatches Judge Dee to far-flung district on the Northwestern border of the Chinese empire, Lan-fang, which is plagued by barbarians, corruption and murder. One of the victims, General Ding, was stabbed in the throat with a small, peculiar looking dagger with a poisoned blade, but the General was holed up in a hermetically sealed mansion when the murderer struck. The impossible crime angle is not as strong as in other locked room novels in this series, but the book, as a whole, is great! Chronologically, The Chinese Gold Murders is the first book in the series and tells the story of Judge Dee's first post as a magistrate of a somber, mournful place, called Peng-lai, where tales are abound of the restless dead. One of them is the previous magistrate of the district who died under mysterious circumstances in his locked library. This is easily one of the best entries in the series! Judge Dee and Ma Joong are on a return journey home, to the district of Poo-yang, which brings them to Paradise Island. Upon their arrival, the island is busy with the celebration surrounding the Festival of the Dead and the only room is the cursed pavilion of the book-title. A place where people have died under unsavory and inexplicable circumstances, which Judge Dee get to witness first hand as he has to explain three seemingly impossible deaths that has occurred in the room – one of them discovered by the judge himself. I remember it as one of the best and most solidly plotted Judge Dee novels, but really should re-read the book to see if it holds up. Under the single-name pseudonym of "Ivans," Jakob van Schevichaven had the honor of becoming the first commercially successful crime writer of the Netherlands. The Forest Spirit is a strange, early example of the serial killer novel: a number of forest rangers were beaten to death in a dark, sprawling wood in Germany. Someone had caved in the back of their heads and in one particular case the murderer left no footprints in the soft soil surrounding the body. However, this impossibility is mentioned only briefly and the revelation of the murderer immediately tells you have the no-footprints trick was done. Not the most impressive entry on this list. A thoroughly bad "detective" story streaked with second-rate thriller material and only a token locked room murder. I recommend you read the review if you want to know more about the content of the story. 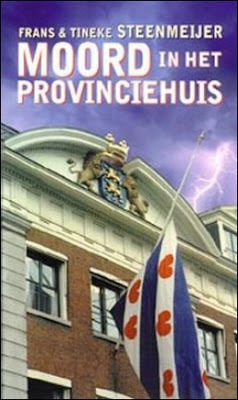 Only the first two chapters deal with the impossible murder of a provincial politician, shot to death during a weekly round-table meeting of the College of Deputies of the Province of Friesland, which is too short to make this really a noteworthy as a locked room mystery. However, the locked room angle, as short as it is, made for one of the better parts of the book. I've not read this book myself, but know of its existence and will pick it up if I ever stumble across a copy. The story is geared to primary school children and is about a couple of aspiring detectives, Iris and Ko, who help the police figure out how a criminal pulled of an escape from a warehouse – which he had barricaded from the inside and was surrounded by the police on the outside. Bertus Aafjes was a world traveler, poet and writer whose oeuvre included several volumes of short stories and a single novella-length mystery about a venerable Japanese magistrate, Judge Ooka – an 18th century judge who presided over the city of Edo (present-day Tokyo). The impossibility in this story falls in the same category as the Egg of Columbus and the Gordian knot. A dishonest bronze caster has been overcharging the prize of the titular water reservoirs, claiming he has used more bronze than he probably did, but, at the time, they had no means to weigh the huge reservoirs. So how could they proof the dishonesty of the bronze caster? Judge Ooka's scheme is as clever as it's simple and is arguably the most original story on this list. A broken leg and the story of a long-forgotten, unsolved and impossible, murder turns Lund into an armchair detective, but the solution was pedestrian and uninspired. Corbijn and De Jong are particuliere onderzoekers (private investigators) who specialize in cold cases and their first recorded investigation concerns the apparent suicide of an obscure and reclusive poet in a log cabin in the woods – where he withdrew from the world to slave over a line of poetry in solitude. There he was found, shot in the face, with traces of gunshot residue on his hand and a double-barreled shotgun next to the body. The door was latched from the inside and the only window could not be opened. So if it's not suicide than how could a murderer have entered and left the log cabin? One of the better locked room tricks on this list! Judge Dee investigates the murder of Commander Soo at a military fortress, shot with an arrow loosened from a room on the other side of the complex, where only one person was present who could have pulled the bowstring. However, this person is proven innocent by Judge Dee and the solution turned this straightforward murder case into a locked room mystery. A very minor locked room tale in which Judge Dee witnesses a ghostly apparition escape from a watched, moonlit, garden with a gate that's securely locked and barred from the inside. Charles C.M. Carlier, a.k.a. De Schaduw (The Shadow), is called on to investigate the alleged suicide of a company director, who apparently shot himself inside his private office, which is nicely resolved in a handful of pages. Ashe Stil is a historian and the author of a series of historical mystery novels and short stories about Willem Lootsman, a waterschout (water bailiff) in the Amsterdam harbor of the Dutch Golden Age, which may be the Dutch counterpart to the historical detective stories by Paul Doherty – as at least two short stories are locked room mysteries. This story is about a greedy merchant found dead inside a hermetically sealed vault. A rich merchant is found murdered inside an upstairs room, locked from the inside, but there was an open window. However, the plot-description noted that the window offered no means of escape to the murderer. So you can expect me to explore this series in the hopefully not so distant future. That's the last one for now, but, surely, this blog-post will be updated in the future and compiling this list gave me an idea for another post, because most of the solutions have something in common – a preferred technique, or approach, to the locked room problem. Something that shows a clear difference in the mindset of Angelo and Germanic mystery writers, but hey, that's subject for another time. "Politics makes liars of us all, Lieutenant." Frans and Tineke Steenmeijer's Moord in het provinciehuis (Murder at Provincial House, 1999) originally appeared in the Frisian language, as Moard yn it provinsjehûs, followed in 2001 with the publication of a Dutch edition and can therefore by categorized as a streekroman (regional novel) with the northern province of Friesland (Frisia) as a backdrop – which probably explains how the book managed to elude me until recently. But when I came across the book and read the plot description, I immediately recognized the characteristics of a potential impossible crime story. According to the synopsis, the story concerns the murder of a provincial politician, shot through the heart, during a meeting of the College of Deputies in a room closed from the outside world. A brief internet search lead me to a website, cataloging Dutch crime-fiction, mentioning that the book opened with "a pleasant, old-fashioned locked room mystery." So my curiosity was duly aroused and wanted to know whether Murder at Provincial House qualified as a genuine locked room novel or simply dealt with a murder committed in a closed-circle of suspects, because the two are often conflated with one another. Well, it turns out the plot worked with both tropes. Murder at Provincial House opens during one of the regular assemblages of the college of the Gedeputeerde Staten van Friesland, but the rituals and routine of the gathering is disturbed when, during a talk on spatial planning, "a strange plop" is heard and one of them slumps back in his chair – a growing bloodstain on his shirt. Someone has shot Fons van Thorn, while everyone sat around him, but nobody in the room could possibly have discharged a gun without being seen. And a search of the premise failed to produce the proverbial smoking gun. It's as if the bullet came out of nowhere and the problem of an inexplicable death in a closed, and watched, room in which several witnesses were present was reminiscent of Max Afford's The Dead Are Blind (1937) and E.R. Punshon's Six Were Present (1956). But the locked room angle here was rather quickly disposed off. During the second chapter, one of the people present in the room notices, what could be called, a clue and the impossibility is fully explained when the third chapter rolls around. Obviously, this altogether too slender plot-thread was inspired by Havank's "De vergrendelde kamer" ("The Bolted Room"), collected De Schaduw & Co (The Shadow & Co, 1957), which I happened to have reviewed here only a fortnight ago, because the authors are apparently great admirers of Havank – an enthusiasm shared by their own series-character, Rijksinspecteur Doede Deschesne. So they probably got the idea for the locked room from that short-short story and tweaked it a bit. Understandably, I was disappointed that the book stopped being an impossible crime by the end of the second chapter, but the explanation showed the killer had knowledge of both the layout of the historic building and movement of the people. Since the crime-scene was a government building and all of the potential suspects were elected representatives or government employees the investigation is given to a special investigator of the Rijksrecherche (state police), Doede Deschesne. Deschesme has his work cut out for him. The victim was the dictionary definition of an infant terrible. A personality trait not everyone around him found endearing. Fons van Thorn was a gynecologist who retired early and, "more or less as a joke," began his own political movement, under the banner of the Gezond Verstand Partij (Common Sense Party), which pulled seven seats underneath the political establishment in previous provincial elections – allowing him to become the Deputy of Environment and Housing. Something that earned him the ire of one of his colleagues, Anna Kup-Boltini, who's fanatical environmentalist and wanted the position to reshape local policy. But he also has a sworn enemy within his own party, Abel Hondelaar, who had been plotting a coup d'état. And there there are the personal motives. Van Thorn was a known philanderer and his latest conquest was a young girl from the finance department, Wiegertje de Groot, which put an end to her relationship with Wigle Adema. They were planning to move in together, but then Van Thorn appeared on the stage. So this gives the young man a potential motive and he does not exactly go out of his way to give Deschesme the idea he's barking up the wrong tree. All of this, and more, has to be sorted out by Deschesme and his capable assistant, Henri Dulder, who loves Columbo and sometimes couldn't resist to imitate the famous TV-detective. So this makes for a pleasant read and the story-telling nostalgically reminded me of the glory days of A.C. Baantjer, but with a plot that appeared to be moving along the same lines as the excellent police-detectives by M.P.O. Books and the Commissioner Daan Vissering series by Cor Docter. Sadly, these positive attributes did not extend all the way to the solution. The murderer was revealed to be a minor character, which is not necessarily a bad thing, but the only tangible clue pointing in this direction was a slip of the tongue. Something that's even harder to spot when you learn about the weak, wishy-washy motive of the murderer. There were a plethora of legitimate suspects with genuine motives, but the authors went for the most underwhelming combination of the two. So that was a bit disappointing. There was, however, a possibility for a clever, Agatha Christie-style solution using the disputed alibi of one of the suspects. A different combination of people, involved with the alibi, would be required, but it would have given the story a splendid and satisfying solution in the Golden Age tradition. So, all in all, Murder at Provincial House has some first-class story-telling, but the plotting was less than perfect and the ending was underwhelming. A pity since the book had all the potential to be one of those rare Dutch detective novels that could stand toe-to-toe with its foreign counterparts. On a semi, related note: my fellow locked room connoisseur, "JJ," wrote a blog-post, titled "A Little Help for My Friends – Finding a Modern Locked Room Mystery for TomCat Attempt #1: Murder in the Oval Office (1989) by Elliott Roosevelt," which weirdly synchronizes with this review. The plots of both books deal with the impossible shooting of a politician inside a secured room of a iconic government building, but Murder in the Oval Office also has a Dutch connection as the author and the detective, Eleanor Roosevelt, were Dutch-Americans. You would almost think we planned this, but we were both unaware what the other was reading. I wish Patrick was still around to point an accusatory finger at the mischievous ghost of Harry Stephen Keeler. "This is no ordinary murder! This is an impossible crime!" 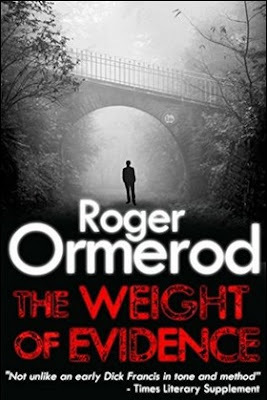 The late Roger Ormerod, who hailed from Wolverhampton, Staffordshire, England, worked a wide variety of jobs during his lifetime, such as postman, factory worker, country court officer and an executive officer in the Department of Social Security, but also moonlighted as a novelist with more than twenty crime-and detective novels under his belt – published over a quarter of a century between 1974 and 1999. 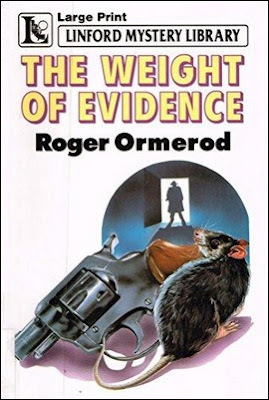 Honestly, I probably would've remained completely ignorant of Ormerod had it not been for the inclusion of three of his books in Robert Adey's invaluable Locked Room Murders (1991). And the descriptions of the impossibilities were original enough to attract my attention. One of these books in particular held my interest. The Weight in Evidence (1978) appears to have brought two of Ormerod series-characters, David Mallin and George Coe, together in a partnership as private-investigators. Mallin seems to have been his main series-characters, debuting in Time to Kill (1974), while Coe only appeared sporadically in such books as A Spoonful of Luger (1975) and A Glimpse of Death (1976) – with the former being one of the three impossible crime novels listed by Adey. They seem to have crossed paths for the first time in Too Late for the Funeral (1977), when they approached the same case from opposite ends, each unaware of the other's interest, which ended with them becoming partners in crime. However, the crossover aspect of the past entries in this series was not the primary reason for picking this particular title. Oh no. 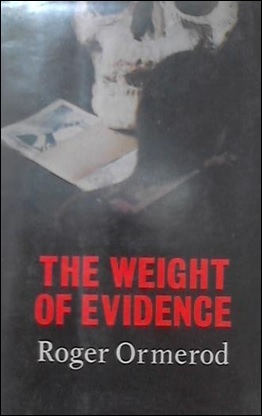 My reason was much more banal: Adey listed not one, but two, impossible situations for The Weight of Evidence. So, just like a kid in a candy store, I pounced on the bag of sweets which looked to me to be the fullest. The Weight of Evidence tells of the first investigation of Mallin and Coe as official partners, which brings them to a fence-enclosed site "in the middle of an area obviously being systematically torn down" by a horde of construction workers. But one of the hard hats has gone missing under inexplicable circumstances. On the previous day, they had erected a site-foreman's shed on the terrain by pouring an eleven by nine slab of concrete on the ground and lowering a floorless shed by crane on this foundation, which was then bolted down on the inside by one of the construction workers, Fred Wallach – who was not a popular member of the crew. So when the crane operator, Walter Dyke, noticed Wallach, who was giving directions in the center of the concrete patch, appeared to be unaware that the shed was coming down the wrong way round he kept his lips sealed. Because a chain-link fence now blocked the door and this trapped Wallach inside the shed. Next thing they know, "the five o'clock hooter" went and they "packed it in," which left Wallach to spend "a cheerful night" trapped inside a bare shed. However, when they returned to the shed it appears to be inexplicably deserted and when the two private-investigators take a look inside they discover the nuts have been bolted down and tightened, which left Wallach with absolutely no room to escape. The chain-link face blocking the door was undisturbed and taking out the window proved to be an unlikely explanation. So how could anyone vanish, like a burst soap-bubble, from a shed with its only exit blocked by a solid, undamaged chain-link fence? It's "a classical locked-room situation." The trick for the impossible disappearance is pretty nifty and logical, splendidly using the bolted down, tightened nuts as red herrings, which did not prevent me from figuring out how Wallach escaped from the blocked shed. However, this was not due to my dazzling abilities as a brilliant armchair reasoner, but because certain elements of the setting and problem reminded me of another locked room novel. I would probably spoil too much by naming the book in question, because the method for the vanishing trick here hinges on exactly the same idea used in the other book to present a murder in a small, completely sealed environment – getting a different result with pretty much the same trick. And Ormerod looks to have been the originator of this locked room idea. Anyway, the impossible disappearance is resolved by the end of the second chapter, but there's a legitimate and very clever reason offered for this early revelation of, what should've been, one of the focal points of the plot. The solution to the first impossibility leads them to a long-forgotten room on the demolition site, bolted from the inside, which contains two bodies: one of them is the missing construction worker, shot through the heart, but the second body has been rotting away in that room for the past thirteen or fourteen years. As it turns out, the decayed skeleton belonged to Marty Coleman, a local, who disappeared after taking part in a bank robbery with the loot. A "bag of white fivers" that could not be spent. A second accomplish, Dutch Marks, got away empty handed and the third one, Karl Lubin, served time for shooting the bank manager. Now he lives in the neighborhood again! So that makes for a nice, double-layered locked room problem, but the bolted door is not even the biggest obstacle facing Mallin, Coe and the police. Coleman and Wallach were shot with the same gun, thirteen years apart, but the missing hand of Coleman suggested the murder weapon had been wrenched from his grasp. But can a gun, "rusted to hell," fire a second, fatal shot after nearly fifteen years? What role does the bank robbery and bag of banknotes play in the case? Are any of the old robbers involved or did Wallach's murderer accidentally stumble across this nifty hiding place? Admittedly, the whodunit angle is the weakest facet of the plot, because Ormerod gave the murderer's identity away when the robbery angle turned up. Mallin made a throwaway remark that contained the whole truth and could have flown under the radar had Ormerod handled this so-called clue with a bit more subtlety and sophistication. Regardless of this blunt handling of the killer's identity, the main attraction of the plot remains the locked rooms and the way in which they were interconnected. One simply could not exist without the other and the only other example I could think of with such a pair of linked impossibilities is John Dickson Carr's The Hollow Man (1935). Of course, The Weight of Evidence is not in the same league as that landmark impossible crime novel by the master himself, but the ambition was definitely there and the locked rooms were good, and original, enough for Adey to label the book as "the genuine article." Even though he was taken somewhat aback by the complexity of how both locked room tricks were stringed together. I fully admit the story would have benefited from some maps or diagrams, but the tricks are not impossible to imagine. You just have to read the explanations very carefully. So, no, it would be unfair to compare The Weight of Evidence to some of the classics of the genre, but I think a comparison with the trio of locked room novels Bill Pronzini wrote during the 1980s is allowable. I know Pronzini is an American and Ormerod was English, but everything about this book, such as the tone, atmosphere and plot, felt not entirely dissimilar to Hoodwink (1981), Scattershot (1982) and Bones (1985). Particularly the last one felt similar in mood to this one as well as dealing with skeletal remains and an impossible crime. So you should expect something along the lines of a 1980s Nameless Detective novel when picking this one up. As you can probably judge by this review, you have not heard the last of Ormerod on this blog and I'll not limit myself to his handful of locked room novels. Some of his "normal" detective stories also piqued my interest and found some of the negative commentary on his work by the critics very encouraging, which stated that his labyrinthine plots tend to have too many twists and turns. Ha! There's no such thing as too many twists and turns in a traditionally (styled) detective story. So expect a quick return to this writer, but the next blog-post might be taking a look at a Dutch mystery novel with, what might be, a very unusual locked room problem.